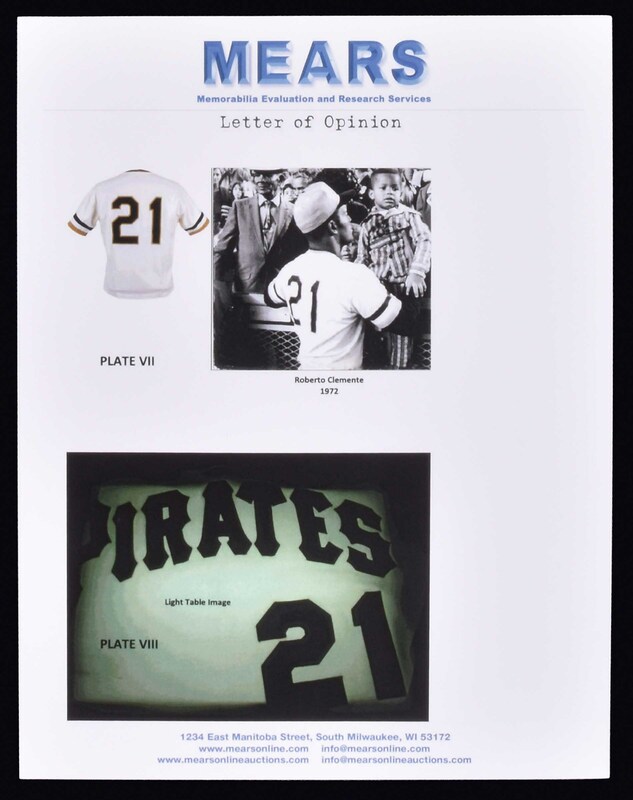 Pittsburgh Pirates home jersey worn by Hall of Fame outfielder Roberto Clemente during the 1971 and/or 1972 season(s). Graded A8.5 by MEARS. 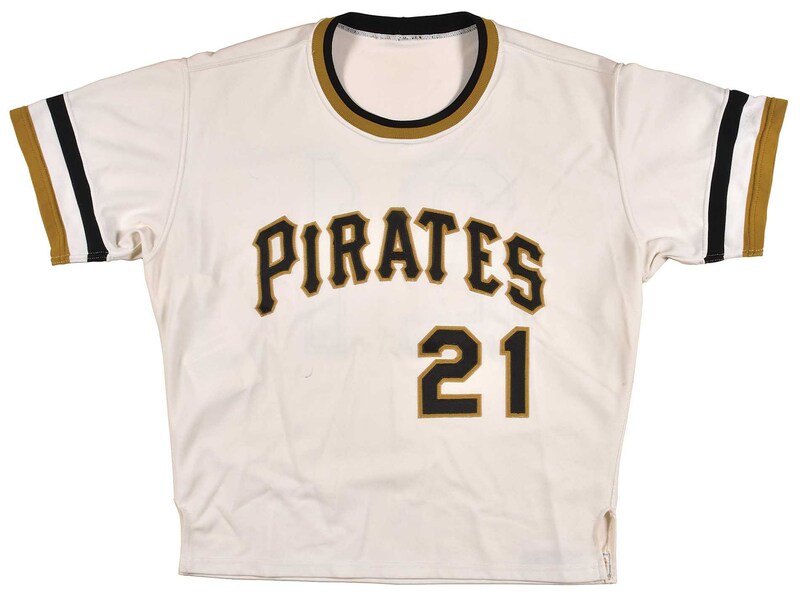 The white knit jersey is lettered "Pirates" on the front and features the number "21" on the left breast and reverse. All letters and numerals are are appliquéd in black on gold tackle twill. 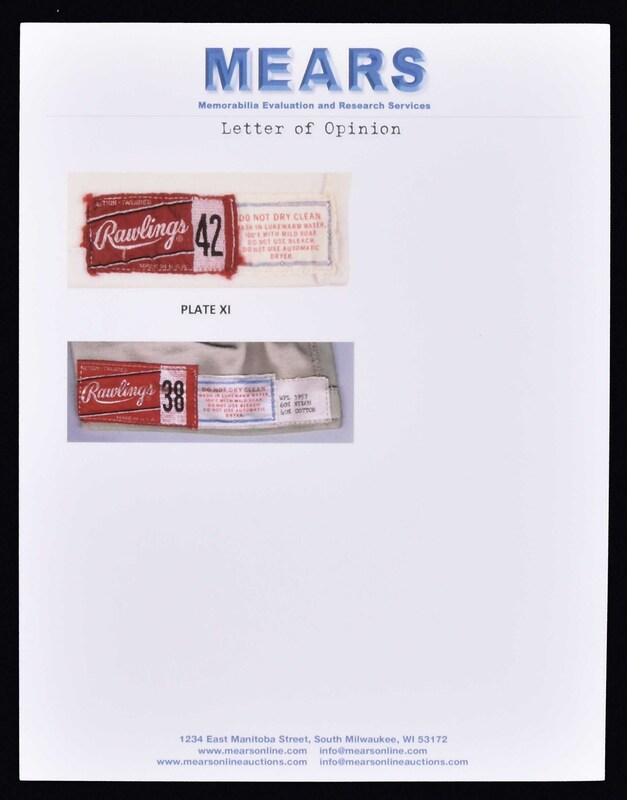 A "Rawlings 42" label and adjacent laundry tag are located on the interior rear, left tail. 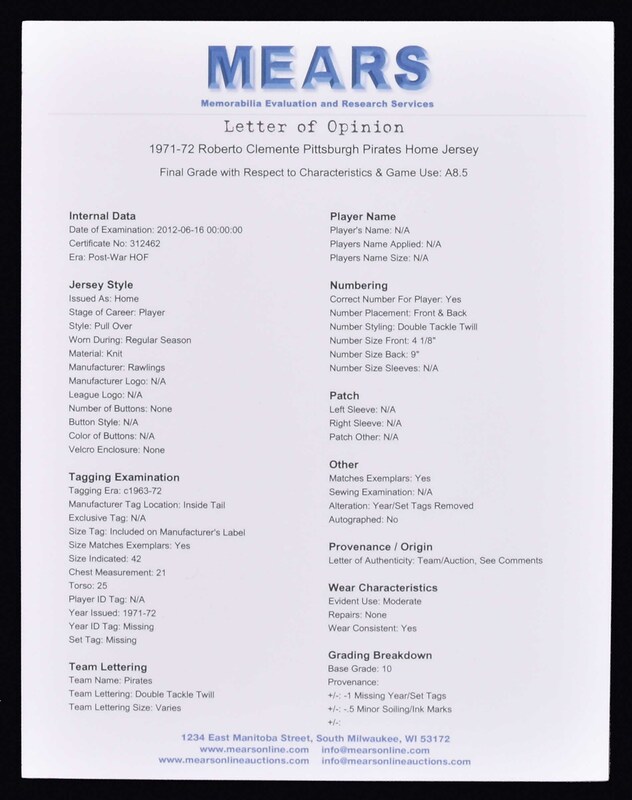 The slight ambiguity regarding the jersey's year of issue is related to the removal of the year/set tag, which was originally attached to the right of the laundry tag. 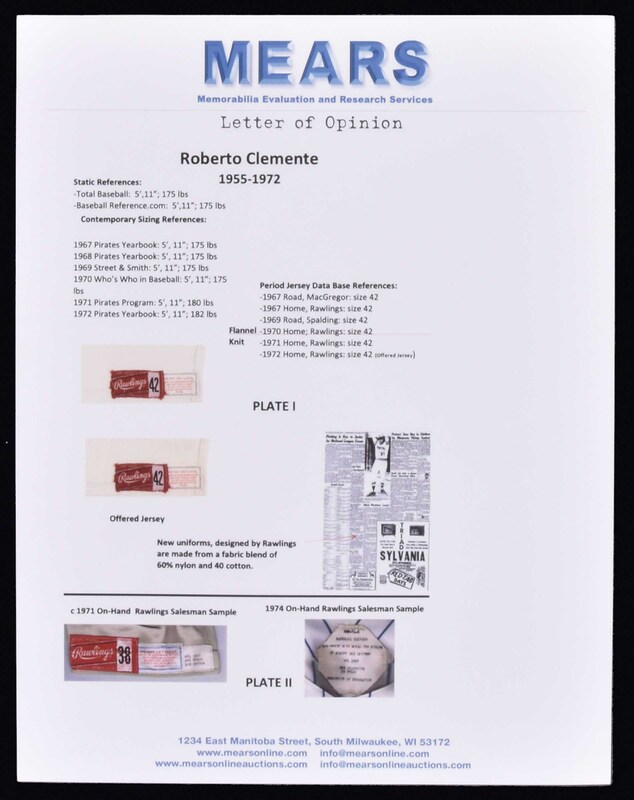 As Dave Grob of MEARS notes in his analysis (the entire MEARS LOA can be viewed on our website), the removal of the year tag "was not an issue of great concern for me (other than dating), in that based on how close the laundry instructions were sewn to the outer edge of the fabric, the removed tag could not have been a salesman's sample fabric content tag." 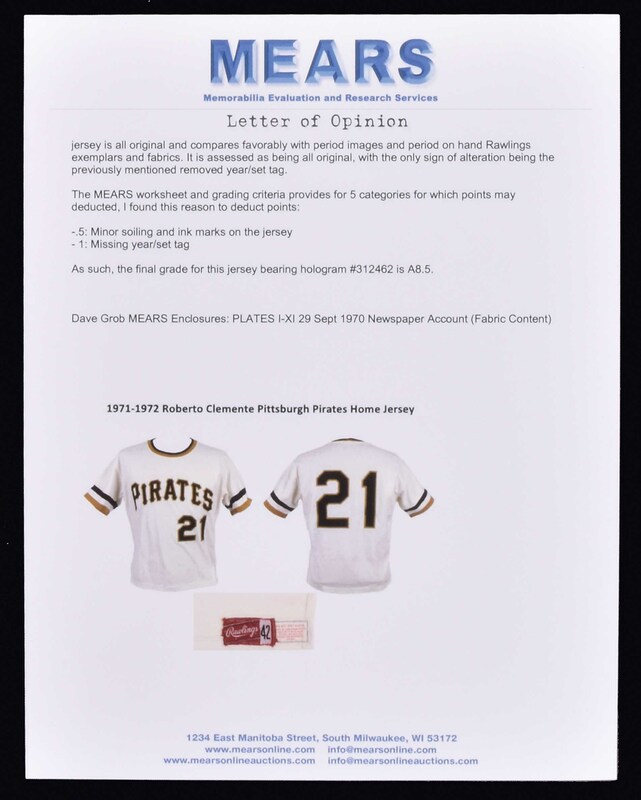 Despite the missing the tag, Grob concludes by writing "In my opinion this jersey possesses all the characteristics you would expect to see in jersey manufactured in 1971 or 1972 by Rawlings for use and wear by Roberto Clemente. (The Pirates began the practice of wearing knit jerseys in 1970; the Rawlings tag on the offered jersey dates to the 1963-1972 manufacturing period.) 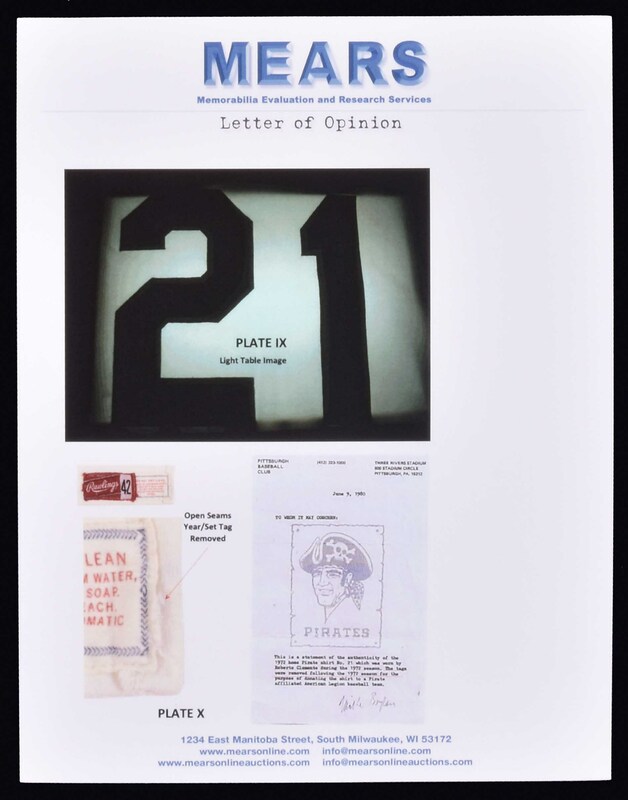 The missing year tag is addressed in an accompanying one-page typed letter, dated June 9, 1980, on Pittsburgh Pirates letterhead, signed by a gentleman named "Mike Boylan." 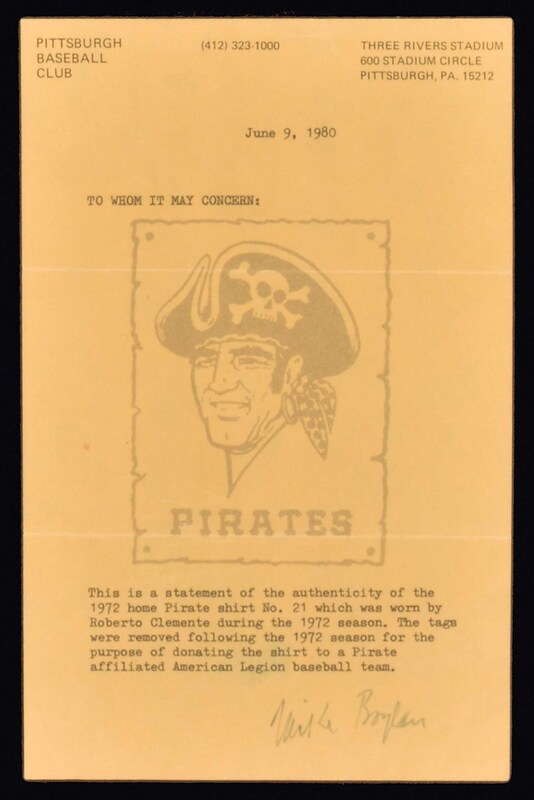 In full: "To Whom It May Concern: This is a statement of the authenticity of the 1972 home Pirate shirt No. 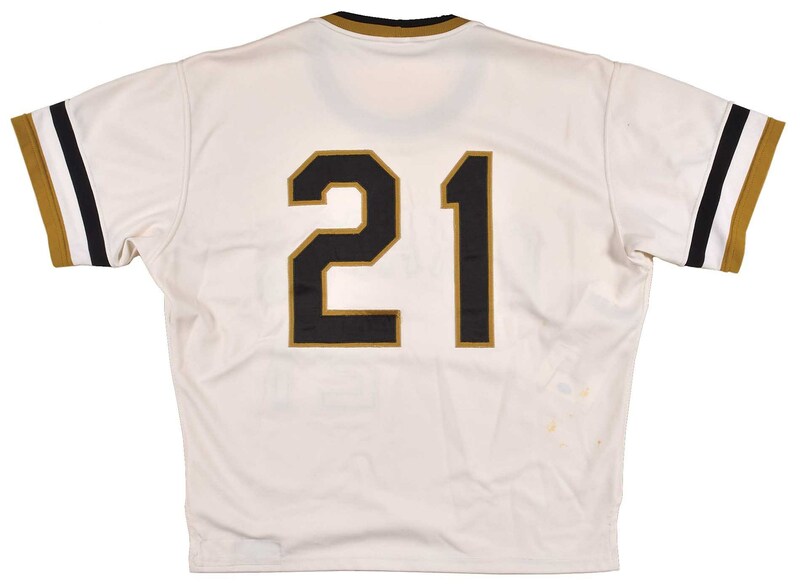 21 which was worn by Roberto Clemente during the 1972 season. 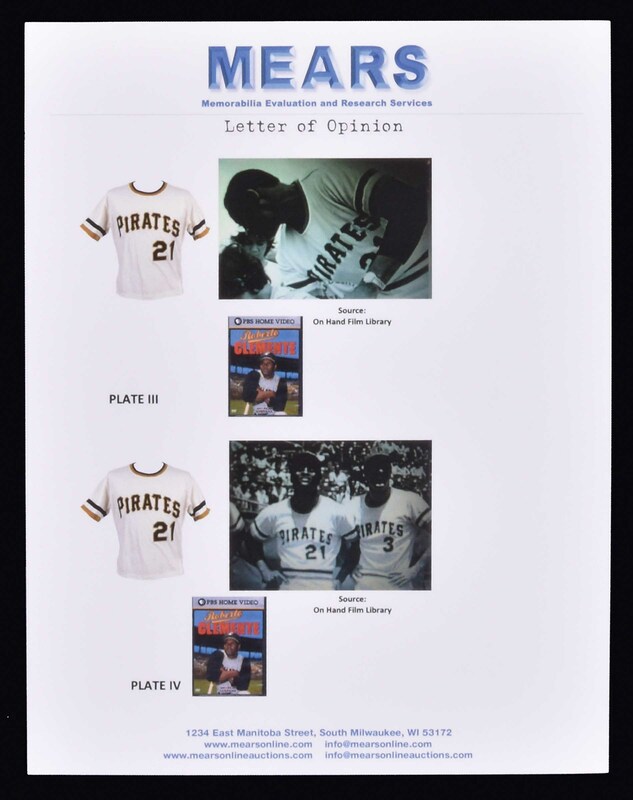 The tags were removed following the 1972 season for the purpose of donating the shirt to a Pirate affiliated American Legion baseball team." With the exception of the removed year/set tag, the jersey remains original as issued, with no other alterations. Moderate wear is displayed throughout, including a few small areas of minor soiling on the reverse, and two small ink marks on the front. 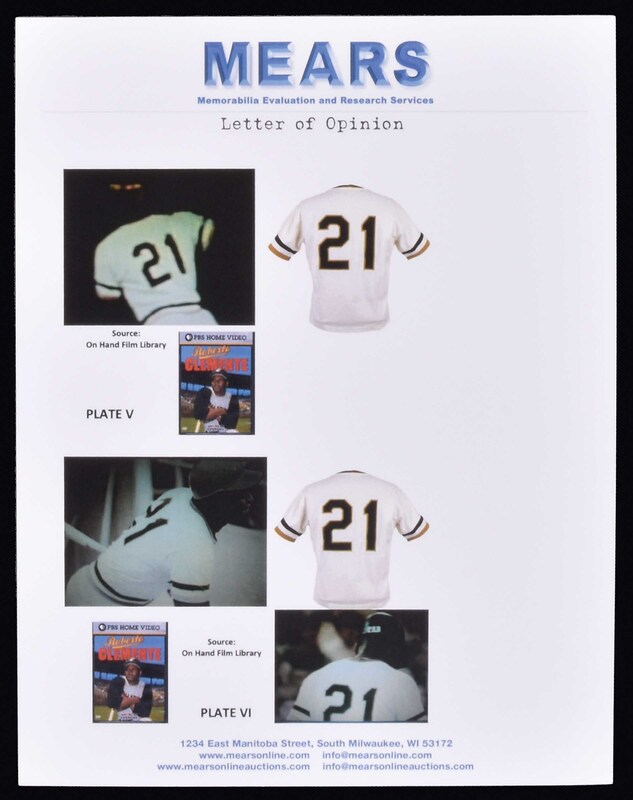 Although the loss of the year tag makes it impossible to conclusively date the jersey to the 1972 season, the accompanying letter from Boylan indicates that it was from 1972. If so, this jersey dates not only to Clemente's final season, but possibly his final game in which he recorded his 3,000th hit. (The Pirates ended the 1972 season at home against the St. Louis Cardinals.) A great humanitarian as well as an accomplished ballplayer, Clemente died tragically in a plane crash on December 31, 1972, while flying relief supplies to earthquake victims in Nicaragua. The following year he became the first Hispanic ballplayer elected to the Baseball Hall of Fame (the Hall waived its normal five-year waiting period in his honor). Clemente jerseys, both flannels and knits, are scarce. This is just the second Clemente jersey we have ever offered and the first knit example. 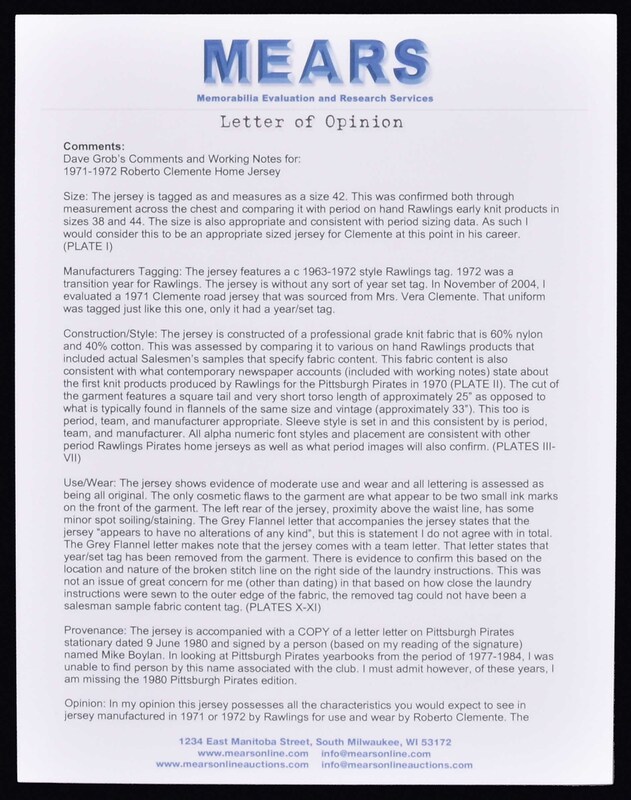 Graded A8.5 by MEARS (base grade of 10, with one point deducted for the missing year tag and a half point deducted for the soiling and ink marks). Full LOA from MEARS. Reserve $10,000. Estimate (open).